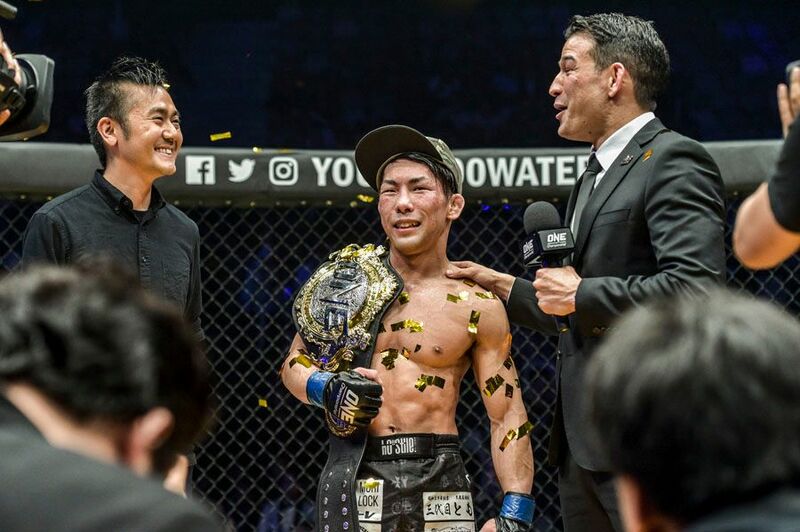 A new champion was crowned in the first ONE Championship event of 2019 as Yosuke Saruta dethroned Joshua Pacio to become the new strawweight champion on Saturday in Jakarta. 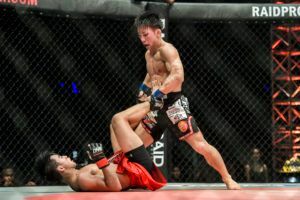 Saruta just made his ONE Championship debut this past December as he earned a victory over former champion Alex Silva. Now less than two months later, the Japanese strawweight is standing tall as champion. 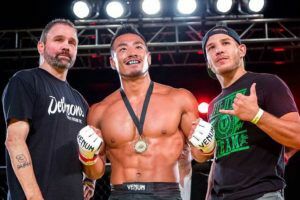 The fight was really the tale of two battles with Saruta constantly looking to out wrestle and out grapple his opponent while Pacio spent all 25 minutes trying to counter takedowns and put together striking combinations that would get him the win. 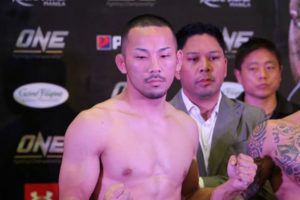 It was a back and forth affair in nearly every round with Saruta playing the aggressor as he constantly stalked Pacio across the cage while attempting to drag the Filipino fighter to the ground. Saruta did a good job finding the opening for his takedowns round after round, although he did struggle to maintain control of Pacio on the bottom as he constantly scrambled free to restart the fight on the feet. 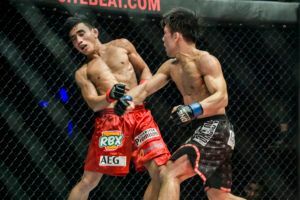 While he was constantly defending takedown attempts, Pacio still managed to land some strong combinations that left Saruta wearing the damage from those strikes throughout the fight. 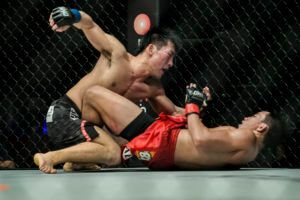 The back and forth affair continued in virtually every minute of every round with Saruta showcasing a high level grappling attack and Pacio doing his best to counter it with a high volume offense on the feet. 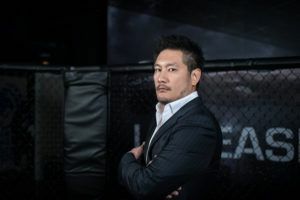 It seemed for every punch, kick or knee that Pacio landed, however, it was Saruta who would find a way to drive forward and still manage to get the takedown. Still, Pacio wasn’t conceding anything while constantly fishing for submissions off his back while tirelessly scrambling free before he got locked into a bad position. When the fight came to an end it was anybody’s guess who was going to walk away with the championship. Saruta was definitely pressing the pace over the course of all five rounds while landing a huge number of takedowns. Meanwhile, Pacio did a good job countering the relentless attacks from Saruta trying to drag him down to the mat. 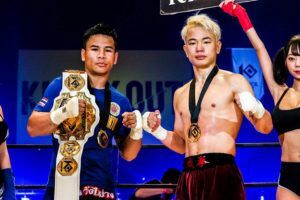 As the scorecards were read, two judges gave the nod to Saruta, who immediately celebrated his victory as he was crowned the new ONE strawweight world champion. It’s quite a start to Saruta’s career with ONE Championship while going 2-0 through two fights thus far and becoming a world champion. Given how close this fight was over all five rounds, Saruta (19-8) might be staring back across the cage at Pacio (16-3) sooner rather than later. 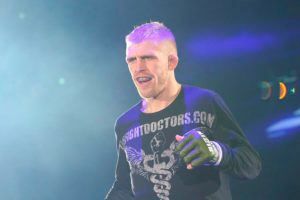 Following a disqualification loss in their first fight last year, Christian Lee exacted revenge on Edward Kelly with a one-sided beatdown in the rematch. The 20-year old martial arts prodigy lost his fight with Kelly last year due to an illegal suplex so he was obviously anxious to settle the score. Lee wasted no time proving that he was the superior fighter as he marched across the cage and almost immediately locked on his signature Terminator guillotine choke before dragging Kelly to the mat. Kelly desperately tried to break free from the submission and while he finally got out of the choke, he then found himself with his back on the canvas with Lee in the mount raining down elbows on him from the top. Lee continued to blast away with Kelly trying to wiggle and squirm his way free without absorbing too much damage. Finally, Lee switched from elbows to punches as he postured up inside the mount and began firing down on Kelly with a series of shots that absolutely shredded his defense. A right hand blasted the jaw of Kelly (11-6) followed by a left hand that put him out as the referee rushed into stop the contest before Lee could punish him any further. The end came at 2:53 into the opening round. 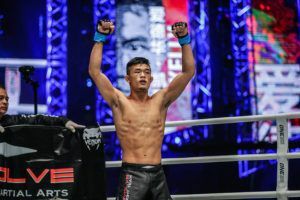 With two TKO wins in a row, Lee (11-3) believes he is ready for another shot at ONE featherweight world champion Martin Nguyen in 2019. 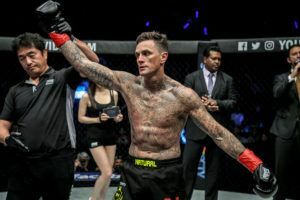 Lee is now also the all-time wins leader in ONE Championship after getting number 11 with his victory against Kelly on Saturday in Jakarta. Puja Tomar (4-3) pulled off a massive upset in her atomweight fight against hometown hero Priscilla Hertati Lumban Gaol (5-4), edging out the Indonesian by split decision after three rounds. Tomar came out like a ball of fire in the opening round as she took Lumban Gaol down to the ground, shredded her guard and took the back. Tomar blasted away at Lumban Gaol with punches before transitioning in an attempt to finish the fight with a submission. 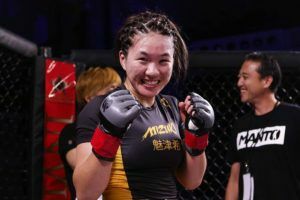 When Lumban Gaol refused to give up, Tomar switched back to a ground and pound attack as she battered her opponent with punches as the crowd inside the Istora Senayan went silent. Lumban Gaol survived the round and then began to mount her comeback with several submisssiona attempts of her own after dragging Tomar down to the mat. Lumban Gaol nearly locked up a knee bar and then she looked for a heel hook while Tomar was constantly twisting and turning in an attempt to break free. As the fight continued, Tomar managed to counter Lumban Gaol with a guillotine choke attempt after another takedown from the Indonesian atomweight. Once again, Tomar couldn’t get the finish but she was adding up damage done along with those submission attempts, which obviously helped sway the judges in her favor. Lumban Gaol had her best round of the fight during the final five minutes when she took Tomar down to the ground and managed to take her back. Lumban Gaol had Tomar in trouble throughout as she punched away from the back and nearly locked up the rear naked choke submission. Referee Olivier Coste was constantly watching to see if Tomar was looking for a way out but she refused to concede defeat while Lumban Gaol desperately tried to get the finish. Time finally ran out on Lumban Gaol but the Indonesian crowd was firmly on her side after a strong end to the fight. Still, Tomar had mounted a lot of offense throughout the course of the fight and that ultimately earned her the nod from two of the three judges to eke out the split decision victory. 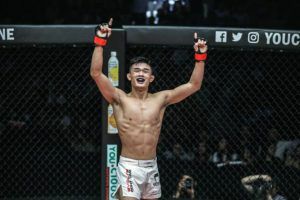 Robin Catalan added onto Stefer Rahardian’s considerable woes with a strong striking attack over three rounds to earn a unanimous decision in their strawweight showdown in Indonesia. 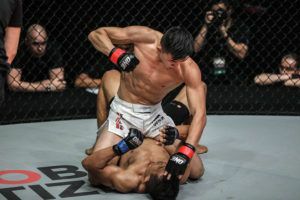 After watching his brother Rene employ a similar strategy last July, this time it was Robin Catalan who blasted away at Rahardian from the outside with leg kicks and then punishing the Jakarta native with punches any time he attempted to duck his head to look for the takedown. Catalan even managed to put Rahardian on his back with a surprise wrestling attack that included a huge slam in the third and final round. 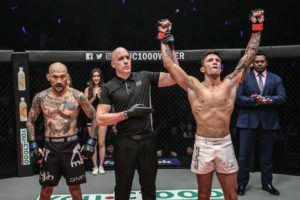 When it was over, Catalan (8-5) had obviously maintained control over all three rounds to earn the unanimous decision victory while Rahardian (8-3) dropped his third fight in a row following a promising 9-0 start to his career. 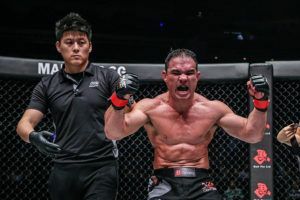 The main card kicked off with submission specialist Bruno Pucci pulling off the biggest win of his career over former ONE world champion Kotetsu Boku in the opening round in their featherweight matchup. Pucci wasted no time looking for the takedown almost as quickly as the fight got started and once he got Boku to the mat, he maintained a huge grappling advantage. Pucci eventually worked his way to take the back before sinking in the rear naked choke submission and Boku just couldn’t find a way to break free from the submission. With a noticeable grimace on his face, Boku (26-13) finally tapped out with Pucci quickly rising from the ground with a primal scream to celebrate the statement victory. Pucci (7-3) has now won his last two fights in a row as he finally finds solid ground in the ONE Championship featherweight division.